This hankie edging was all sewn up into a flounce of some sort. It may have been used as a little neck jabot. So the center was already cut out. Anyway the needlelace corners are done in an interesting way. 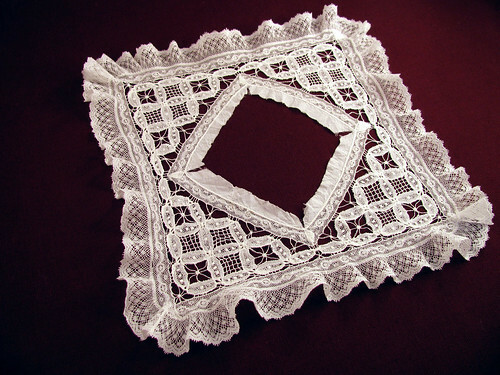 A thin trimming lace has been wrapped with thread at intervals and crossed to give the joined wedding ring motif. The centers are then filled in with needlelace. 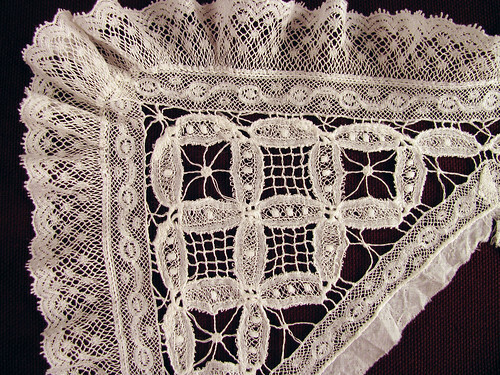 It is another example of lace trim being combined to form an allover lace pattern. Sorry the photo is off center. I am feeling a little rushed today. 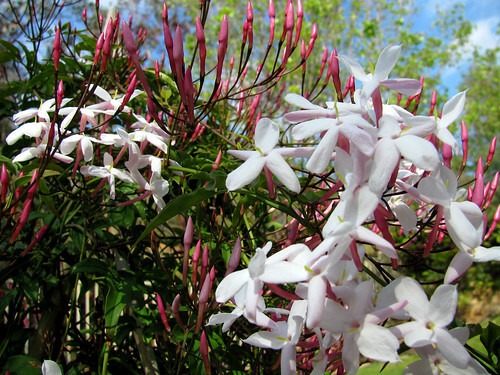 The jasmine is in full bloom now. This entry was posted on Monday, March 30th, 2009 at 3:00 am and is filed under Lace and Vintage. Tagged: Lace, Needlelace, Sewing, Vintage. You can feed this entry. You can leave a response, or trackback from your own site. ooooooo…. all sorts of pretties!! I can’t wait for it to warm up so I can do some planting around my house. I have a couple spring flowers coming up that the previous owners must have put in. Wow, isn’t that a lovely bit of lace! Thanks for the close up!